The story of how the Poppy became an international symbol of remembrance is a remarkable one. The association of the red poppy — the Flanders Poppy — with battlefield deaths as a natural symbol of resurrection and remembrance dates back to the Napoleonic Wars when poppies were the first plant to grow in the churned up soil of soldiers' graves in the area of Flanders. This connection between the red poppy and war dead was renewed over a century later on the Western Front during the First World War. 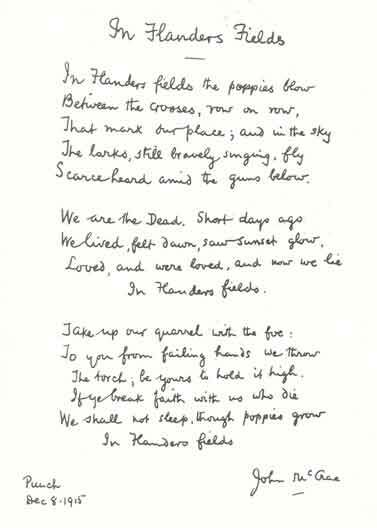 It was verses by Lieutenant-Colonel John McCrae (1872-1918), a Canadian Medical Officer, which began the intriguing process by which the Flanders Poppy became immortalised worldwide as the symbol of remembrance. The inspiration for the verses had been the death of a fellow officer, Lt Alexis Helmer, of the 1st Brigade Canadian Field Artillery on 2 May 1915, during the Second Battle of Ypres (Ieper) in western Belgium, for whom McCrae had performed the burial service. 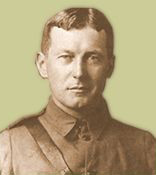 McCrae's verses, which he had scribbled in pencil on a page torn from his despatch book, were sent anonymously by a fellow officer to the English magazine, Punch, which published them under the title 'In Flanders Fields' on 8 December 1915. Moina Michael hereafter made a personal pledge to 'keep the faith' and vowed always to wear a red poppy of Flanders Fields as a symbol of remembrance. Compelled to make a note of this pledge she hastily scribbled her response, entitled "We Shall Keep the Faith", on the back of a used envelope. The Origin of the Remembrance Poppy. When the Conference delegates gave Moina a gift of ten dollars in appreciation of her assistance, she went to a New York department store and purchased 25 artificial red poppies and, pinning one on her own collar, distributed the remainder to the YMCA secretaries with an explanation of her motivation. She viewed this act as the first group distribution of the Flanders Fields Memorial Poppy. Moina Michael hereafter tirelessly campaigned to get the poppy adopted as a national symbol of remembrance. In September 1920 the American Legion adopted the Poppy as such at its annual Convention. Attending that Convention was a French woman who was about to promote the poppy — as a symbol of remembrance — throughout the world. Madame E. Guérin, conceived the idea of widows manufacturing artificial poppies in the devastated areas of Northern France which then could be sold by veterans' organisations worldwide for their own veterans and dependants as well as the benefit of destitute French children. Throughout 1920-21, Guérin and her representatives approached veteran organisations' in the United States, Britain, Canada, Australia and New Zealand and urged them to adopt the poppy as a symbol of remembrance. It was as a result of the efforts of Michael and Guérin — both of whom became known endearingly as the "Poppy Lady" — that the poppy became an international symbol of remembrance.